After a long trip home on an international flight, the last thing any traveler wants is to wait in the dreaded U.S. Customs line. But for a few pro travelers, dealing with the U.S. Customs Bureau has never been easier or faster. Now you can join them in cutting the Customs line on your next return flight into the USA. Their tool is called the Mobile Passport App. Global Entry, while different requires you to apply every 5 years in addition to getting fingerprinted is a completely different option for expediting your customs experience…. but let’s talk cellphone apps for a minute. 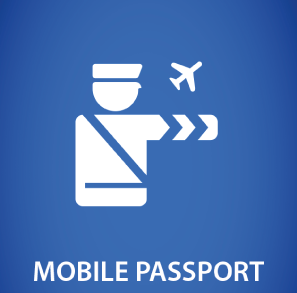 Mobile Passport was developed by Airside Mobile to make traveling through U.S. Custom and Border Protection (CBP) hassle-free. This app is currently endorsed by both the U.S. Customs and Border Protection and the North America Airports Council International, and it is sponsored by Boeing. Best of all, this app is completely free to download for anyone with an iPhone, Android device, or Amazon Kindle. So how can you make this app work for you? To begin, you will have to download the Mobile Passport App from iTunes, Google Play, or Amazon. After that, there is a very simple four-step process each traveler has to follow carefully. First, you will have to type in all of your personal information as it is stated on your official passport. The CBP also allows you to enter in your entire family’s information here. Since this app is backed by the CBP, you can rest assured that all your personal information is secure. All of this information is kept strictly private between Customs officials and you. Second, the CBP will ask you four questions about your trip that you have to answer. After you have answered these questions, you will be given one final chance to ensure that you did not put any embarrassing typos in your official report before filing it. Third, after you arrive in the USA, you will have to submit your data to the CBP through this app. You can use either your wireless carrier or Wi-Fi. After you submit this data, the CBP will send you a receipt with a barcode through the app. This barcode will be used in your screening. But there is no need to hurry, this barcode will be valid for four hours after you receive it. Finally, once you reach the Customs line, you can do a happy dance down the special line marked “Mobile Passport Control.” All you have to do once you reach the CBP official is show him/her your passport, answer a few questions, and then scan your barcode. Since all of your information has already been entered into the app, you won’t need to fill out any lengthy paperwork at Customs. The CBP officer only has to worry about identity verification and a few other questions. Obviously this significantly reduces travel stress, fatigue, and wait time. Check out the screen shots provided by the official Mobile Passport app website below. According to a news report on Hartsfield Jackson’s ATL News, people who used this mobile app have reduced their wait times by up to 20 percent. While the ordinary wait time at Customs could easily be over an hour at the more popular airports, people using this app generally never wait longer than 30 minutes. The very first airport to use this app is also one of the busiest in the nation, Hartsfield-Jackson Atlanta International Airport. This airport began using the Mobile Passport App in August of 2014 to many satisfied savvy travelers. Over a dozen other airports have since followed Hartsfield-Jackson’s lead. There is also good news for Canadians who wish to use this app. Canadian citizens with a valid Canadian passport and either a B1 or B2 visa are allowed to use the Mobile Passport App when returning to the USA. Bloggers, avid travelers and reporters for major new agencies such as the Chicago Tribune and CNN have been raving about this free app. If you are ever traveling internationally through any of these airports, you owe it to yourself to download this app and see what all the commotion is about. With this hot app on your cell phone, you will sail through U.S. Customs faster than ever before.